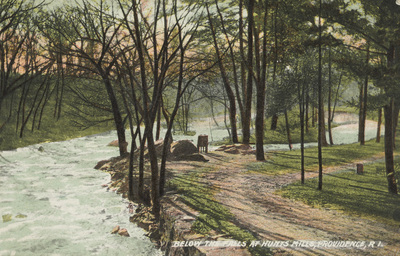 "Below the Falls at Hunts Mills, Providence, R.I." by Reichner Bros., Publishers, Boston, Munchen, Leipzig. Below the Falls at Hunts Mills, Providence, R.I.
Reichner Bros., Publishers, Boston, Munchen, Leipzig. Used; Postmark: November 5, 1907. Reichner Bros., Publishers, Boston, Munchen, Leipzig., "Below the Falls at Hunts Mills, Providence, R.I." (1907). Rhode Island Postcards. 424.